Enjoy the beautiful sandy beaches of Gulf Shores and create wonderful memories. **Las Dunas Fort Morgan** is located in the Fort Morgan peninsula, just a few minutes from the beach, the bay, the fort and golf! 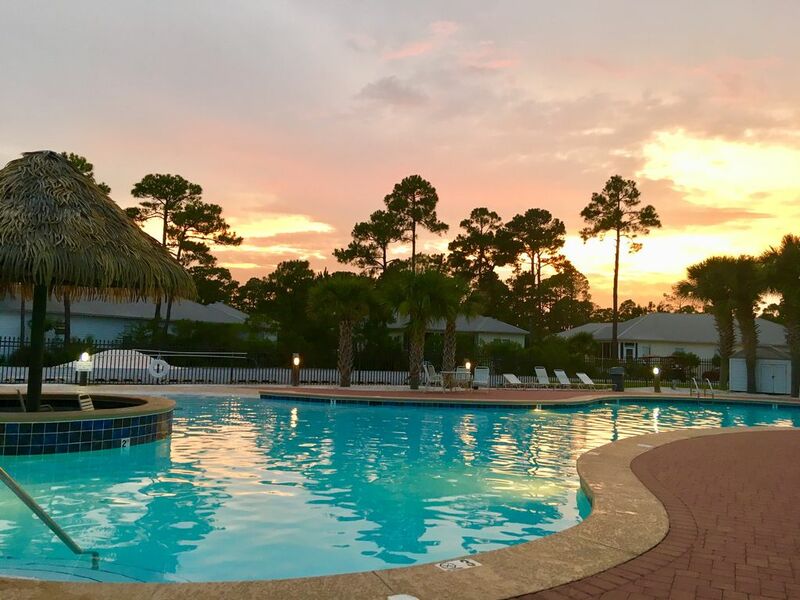 Our house is located at the Rookery complex and our guests can enjoy of a beautiful large, resort style zero entry pool and a tiki bar, a hot tub, and another pool near the entrance of the complex. Our condo has 3 bedrooms, 2 bathrooms, a screened in porch and a patio area outside. The Master bedroom has a Queen size bed, the second bedroom features a Queen size bed, and the third bedroom has 2 sets of bunk beds, one includes a Double size bed. The Rookery development is located at mile marker 6, which is 15 miles down Fort Morgan Road from Gulf Shores. The Rookery is situated surrounded by nature and was designed to be a natural and quiet resort. It is located near the Bon Secour National Wildlife Refuge. Just a great area for families to relax, enjoy nature, swim, play and explore. In addition to the two pools, the complex offers a tennis court and a picnic area with a couple of charcoal grills near the pool. The main pool area and hot tub is located near the tennis court and it also provides guest with a bathroom and shower access. The main pool is heated beginning March 1 through October. Our Vacation Rental is located by the tennis court and quick access to the pool, tennis and BBQ area. Public beach access is across Fort Morgan Road, just a short distance from the Rookery. Turn right leaving the Rookery, go 1/2 block and turn left on Cortez. The beach is straight ahead. Total distance is approx equivalent of three city blocks. A marina, boat dock, and restaurants are located nearby. There are nature trails for walking and hiking, as well as a bike path. The fort at Fort Morgan is another great tourist attraction and well worth a visit. There are two top rated golf courses within a few miles: Kiva Dunes and The Peninsula, and several more within driving range. * Wi-Fi and wired Internet included! * we accept monthly rentals for fall and winter! Note: Renters must be 25 or older. This property offers plenty of entertainment for the family. We have 2 beautiful pools to swim and relax after spending the day at the beach, golfing, hiking or exploring the area. The complex located near the Bon Secour National Wildlife Refuge, so its surrounded by nature. We are located a short distance to the beach, about 2,5 blocks away. The bay is not far away either. Within the complex you'll find a tennis court, which is right behind the house and right by the pool. Short distance to the beach. Access to two pools, tennis courts, picnic area, and a hot tub. Our unit is located really close to the pool area and right by the tennis court. Books and Magazines for kids. The Rookery also offers a book swap box near the pool. We offer some beach toys for the beach and some for the house. This was a nice condo in a great secluded area, away from all the busyness. We stayed in March, and the pool was supposed to be heated, however it was freezing cold. Thank goodness the hot tub was nice and toasty! We had a blast playing family tennis tournaments throughout our stay. The ocean was a bit further than I anticipated; however, there was an option to rent gold carts to get there and back. The only negative about our stay was the bugs. They were absolutely awful. We tried every type of bug spray and it just didn’t help. Our oldest son ended up with about 50-60 bites on his legs. The owners were wonderful and super easy to work with and even let us come a day early! Great stay for those wanting to be away from the hustle and bustle and enjoy the quiet. Home is clean, comfortable and convenient. Close to the pool and beach. Quiet and safe. Our overall experience was wonderful. The beach, pool and spa were great. Our kids really enjoyed Fort Morgan, just a short drive down the road. We also enjoyed the Mardi Gras parade and noticed many community activities available to do. Definitely on my list of places I would come back and visit again. The Rockery property is lovely and well maintained . Clean and neat. Loved the pool and hot tub only 1 minute walk from house. Very quiet area. Owners were very accommodating. We had a great stay! Comfortable, clean house. The owners were quick to answer questions and went above and beyond to mail us an item we left behind. We would definitely stay here again. This is a beautiful home. It was well-appointed with everything we needed. The pool area was perfect for my family. If you are looking for a quiet out-of-the-way place, this is it.